Susan is a Texas native who grew up in Houston. 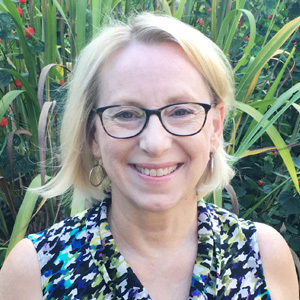 After completing her bachelor’s degree in mathematics at the University of Louisiana Lafayette, she entered the U.S. Navy and served most of her four years in northern Virginia during which time she traveled around the world with a team of experts installing software on naval intelligence systems. After completing her tour of duty she continued on in the information security field at several major defense contractors in the Washington D.C. area. Looking to change her career to something more personally satisfying, she returned to school at George Mason University in Fairfax, Virginia where she studied wintering waterfowl for a Master’s degree in Biology and the effects of pesticides on birds that nest in agriculture for her PhD in Environmental Science. She came to the Gulf Coast Bird Observatory in June 2007 and is now the Director of Conservation Research. Her main research interests are with waterbirds and she currently heads up several research projects in this area. 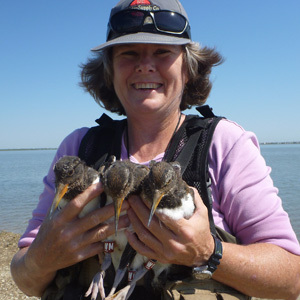 She has been studying American Oystercatchers on the Texas coast since 2011 and works with a cadre of Master Naturalist volunteers to monitor the birds each nesting season. She oversees GCBO’s Beach Nesting Birds and Non-breeding Shorebirds projects which focus on the conservation of beach and bay island nesting and wintering waterbird species. 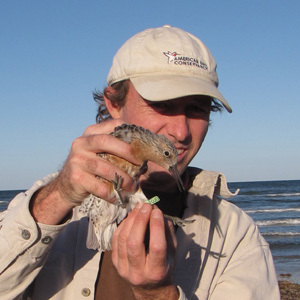 She has two projects in collaboration with biologists at the Texas Mid-Coast National Wildlife Refuge Complex, one studying eastern Willet migration paths and another establishing a Motus tower antenna array along the upper and central coasts to track long-distance migrants outfitted with nanotags. Finally, she manages the Smith Point Hawk Watch held each fall at Smith Point on the eastern shore of Galveston Bay. 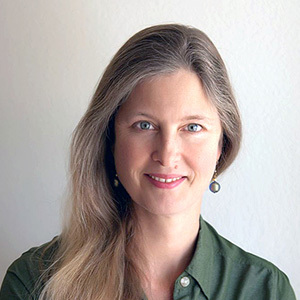 Dr. Liz Smith, Sr. Whooping Crane Scientist and Director of North America Program with the International Crane Foundation in Rockport, will speak on “A Tale of Two Species: Whooping and Sandhill Cranes in North America”. 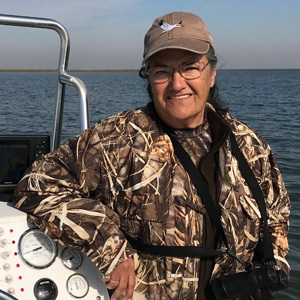 Her extensive research on sea-level rise effects on coastal habitat change and promoting community advocacy for conservation planning and coastal protection have been undertaken to ensure quality wintering habitat along the Texas coast for the recovering Whooping Crane population as well as other coastal species. Ryan Spencer is the partnership coordinator for the Meadows Center for Water and the Environment at Texas State University in San Marcos. He helps develop relationships, build strategic alliances, and foster an inclusive environment in the pursuit of the Meadows Center's Mission: "Inspiring research and leadership that ensures clean, abundant water for the environment and all humanity." He will speak on “The Nature of Art” in an interactive presentation that will engage participants in hands on activities designed to help children engage in creative expression in the outdoors.